The future meets with the past on the virtual frontier. Trails duck in and out of wormholes in space, time, and personal taste. A comment about space westerns morphs into a door into another universe–very similar to the Wild West but different, in that kind of freaky way the best sci-fi stories and films create goose-bumpy ripples of unease and adventure. So it’s about time this site joined the 29th century. What is the basis of westerns? You have to have horses, one might argue. And six-shooters. But is that true? And what about cattle, railroads, or cowboy boots? You don’t have to have any Native Americans (bizarre, given how they were such a presence for the pioneers). Ultimately, it comes down to this: while the outer trappings can change, the tropes of a western do not. You can watch a show about a strong individual fighting for a patch of land to call one’s own and realize it’s set on a small planet in a faraway galaxy, not in Wyoming in 1872. 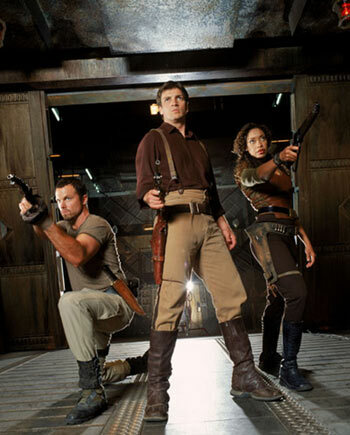 (Firefly’s “Heart of Gold” episode) All that’s missing is, well, Native Americans. Here’s a swell quote by the creator of Firefly, the late, great western, I mean sci-fi series, culled from a fan site. So we have a shared thematic and narrative structure, lots of cool explosions, human pathos, and great steeds. And the mother of all sites for this magnificent combo is a stellar site called simply spacewesterns.com. It has stories of cosmic cowboys ad cow-aliens, tough heroes of either gender and sometimes indeterminate species searching to find a place to call their own in the universe. I spotted interviews from well-regarded scriptwriters (the space cowboy talk behind the space cowboy walk) and senryu contest winners, whose sparse poetry evokes equal amounts of space dust and sagebrush. My favorite story was Fatal Image by Robert Neilson, filled with a meta-reading of westerns and the theme of facing one’s fear–the underpinnings of every great showdown. Yearning to trade your ten-gallon Stetson for a ten-gallon oxygen tank and moon boots? Discover your personal universe with this (Nearly) Complete List, from Edgar Rice Burroughs’s John Carter to Serenity. If cowboys of the nineteenth century had had Internet capacity on the range, they wouldn’t have had to shoot up towns for entertainment–they would have had plenty of excitement exploring this site. Until we meet in the real world, in whatever universe that might reside, happy virtual trails. P.S. Yes to Gary Cooper (eyes number two). Third set is the real cowboy from Texas. First set of eyes….keep guessing.